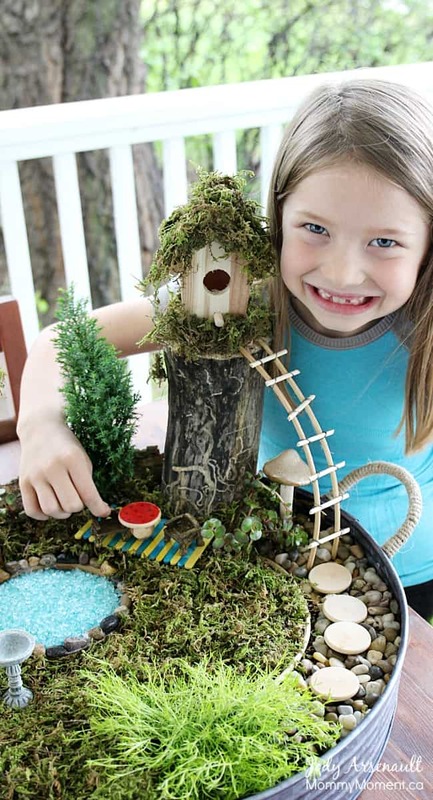 What little girl, or big girl, wouldn’t love their very own magical fairy garden? 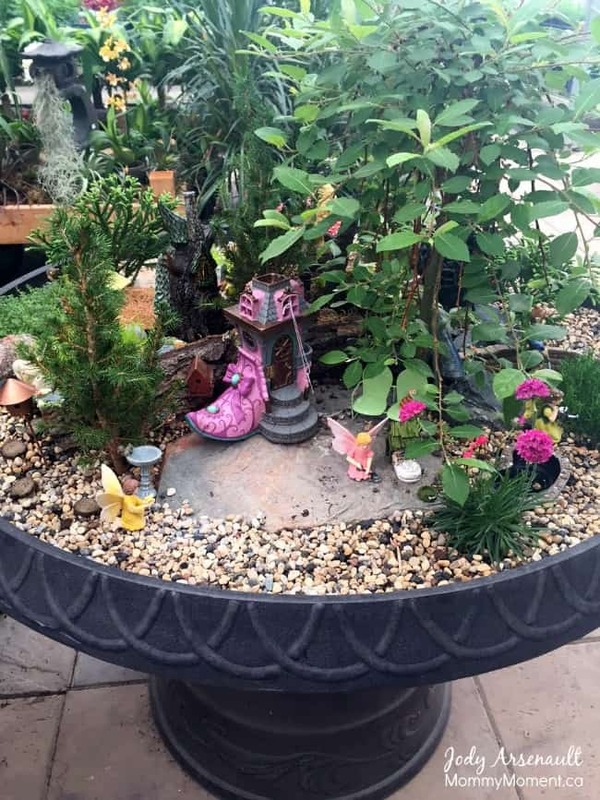 When I got the idea to make a fairy garden for my daughters upcoming birthday, I gasped when I realized how costly they could be. I wanted to make a fairy garden on a budget. With a little bit of creativity and some fantastic finds, I present to you our DIY fairy garden. 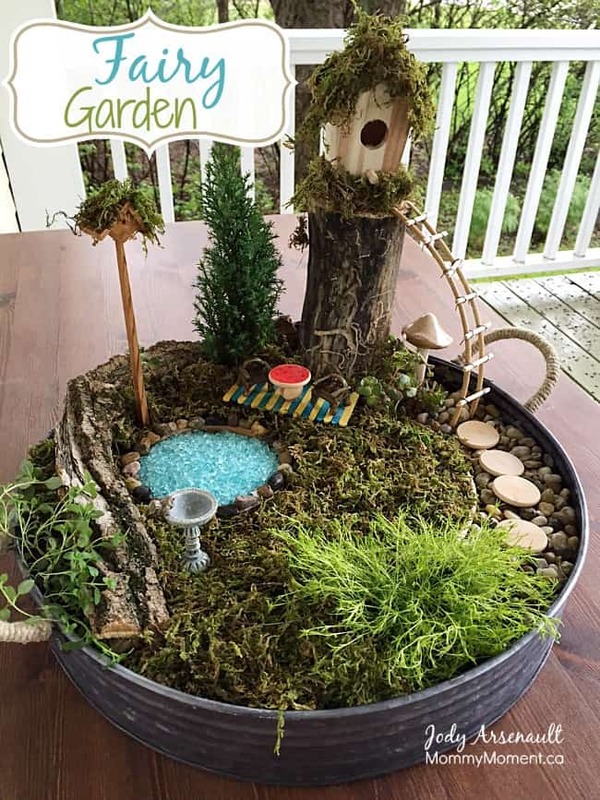 Once you have spent some time looking at fairy garden ideas online or at greenhouses and have an idea of what you want, you are ready to start. 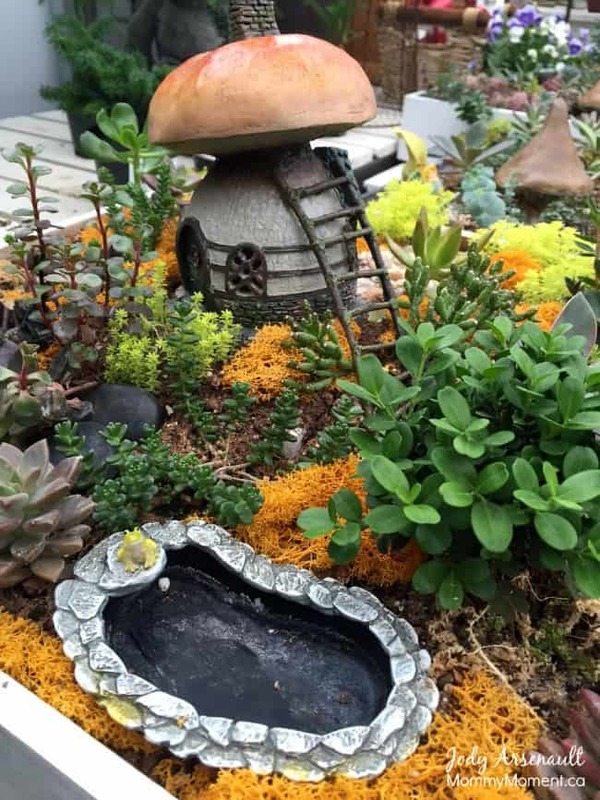 My first tip when making a fairy garden or fairy house is to first consider things you may have around your home or yard. 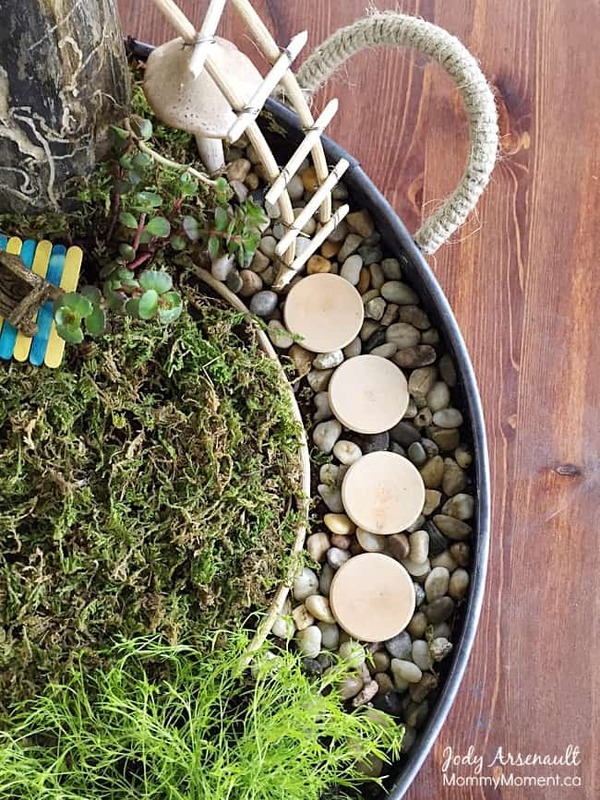 WHAT DO YOU NEED FOR A FAIRY GARDEN? A tree trunk would make a great container, as would a wooden box or even old, broken flower pots would do. Bark, stones, old pieces of wood, string, golf tees, marbles, popsicle sticks, and miniature toys would all offer a great start. Next, go to a dollar store. You would be surprised how much you can find there. Bags of dry moss, little ceramic figurines, wooden sticks, birdhouses, decorative stones etc, you really can pick up a lot for a few dollars. 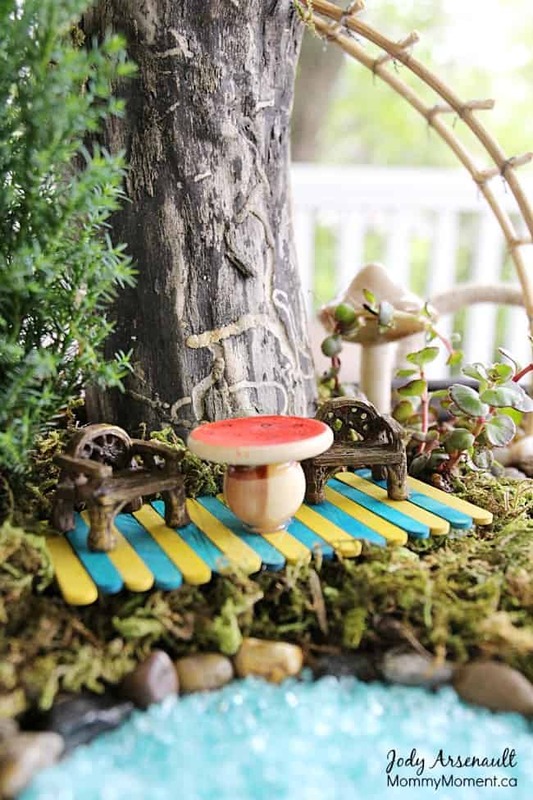 WHAT ARE THE BEST PLANTS TO USE IN A FAIRY GARDEN? Greenhouses are great for finding miniature plants, but sometimes they come with a high price tag. Consider getting herbs like creeping thyme and consider looking at supermarket garden centers to compare prices. There are many great plants for your fairy garden. If you plant perennials, they come up from the ground the following year, and you can replant it in the fairy garden and save yourself a few dollars the next year. Once you have all the basics, if your budget allows, get yourself a few special items to give it the final touch. We bought the little bird bath and the little chairs from the greenhouse. I also decided to splurge on the container since I did not have anything on hand that would work. I found this metal container on clearance because it had a broken handle. So if I would have found an old container, this fairy garden would have all been possible for about $25. I think that is very reasonable. Here are some other fairy gardens I saw at local greenhouses when I was looking for inspiration for mine. This first one was taken at Oakridge Greenhouse. And this one was taken at Sunshine Greenhouse. My daughter has about 2 months until her birthday arrives, but it was a lot of fun making a fairy garden together. 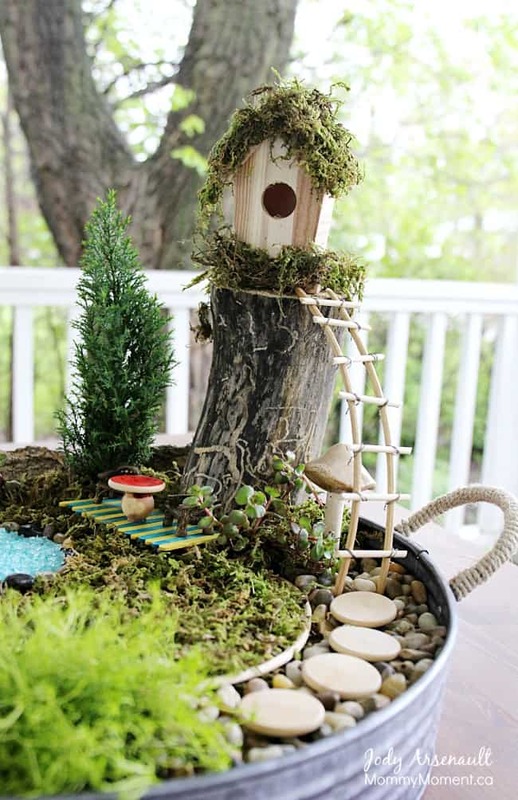 You never know, a fairy or two may decide to make this fairy garden home when the birthday is finally here. 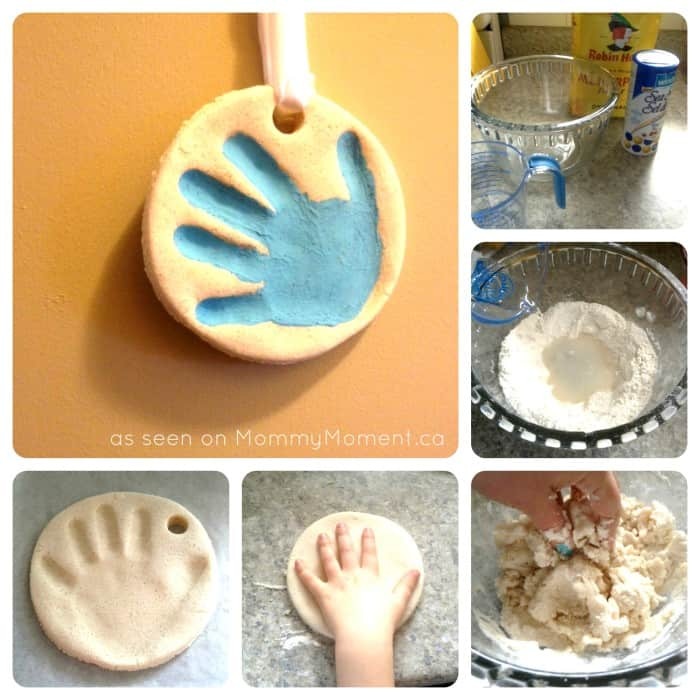 These Salt Dough Handprints are also a lot of fun to make! I love the idea of fairy gardens. They are so cute, dainty and magical. Love your ideas. Dollar store items sound terrific! Thanks Laurie, we are happy with how it turned out. Thanks Elizabeth, I love how fun they are for children. My daughter loves to play and dream and make up beautiful stories while playing in the fairy garden. I also love the responsibility it teaches (watering and caring for it). So CUTE!!! Where did you find the container you put everything in? It is the perfect size and just what we have been looking for. I picked mine up in the clearance section at winners. 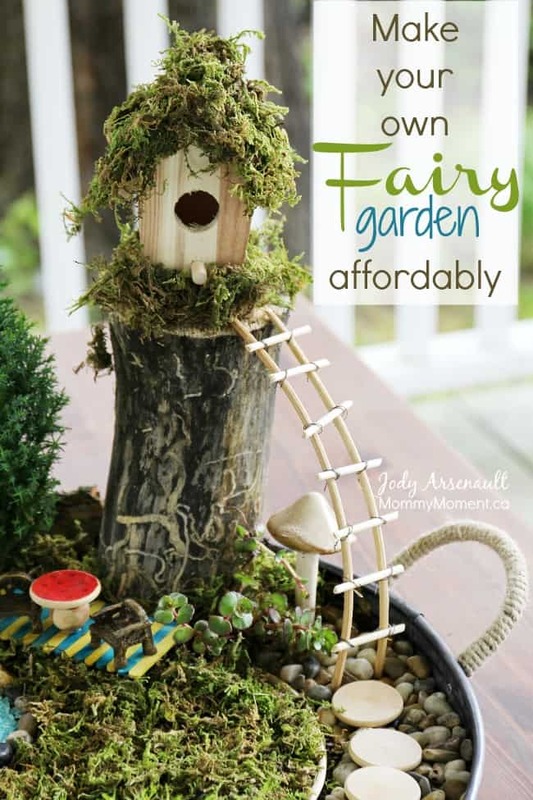 Thanks for the great fairy garden ideas. They are so popular right now but retail ones are super expensive. 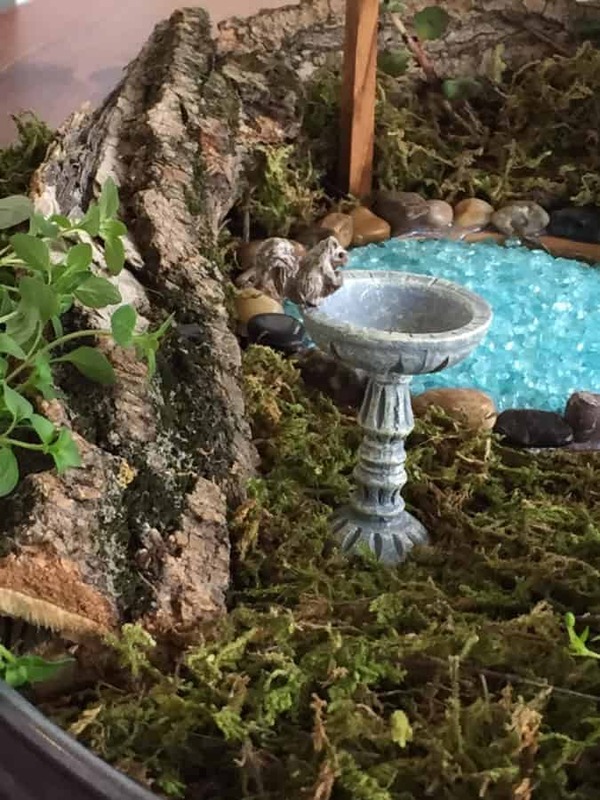 We made a low cost gerarium with a large glass bowl from Michaels, ivy and climbing plants from our local garden centre and fairy statues from the dollar store….super fun activity! You did a great job, I was thinking of making one myself. They are so beautiful! Thank-you – it was so much fun and my girls absolutely love it.